The next piece of downloadable content for Metal Gear Rising, called Blade Wolf, has been released on the PSN and XBL Marketplace. It retails for $6.99 (or equivalent in Microsoft Points) and has players using the dreaded boss from the base game, Blade Wolf. Despite being four-legged, Blade Wolf controls just as well as Raiden and Sam. He (it?) can jump, dash, dodge and parry. It has been a bit since I last played MGR, so parrying took time to work off the rust. I didn't get much practice since I was favoring stealth kills to open combat. The quick attack uses the claws, while the strong attack has Blade Wolf grabbing the chainsaw on his back and using that. It's pretty much the attacks he uses to destroy you in the base game. If you do the full combo with the chainsaw, he will even say "combination attack" and "combination complete". Nice touch! If you use the strong attack while dashing, he will do the spiral dash. A jumping strong attack is a very powerful and useful spinning saw-like attack. Overall, some nice moves to cut up your enemies. The scariest part of the story was seeing other blade wolves running around. They are not boss fights, so they aren't very hard. They can still do tons of damage to you though. Blade Wolf is pretty mobile, so it wasn't too hard to run around and dodge attacks from the enemies I did fight. Also, I only really ran into the dreaded camera issues on the final boss fight, which was a relief. That was the hardest fight in the story, and did take me a try or two before I won the fight (at first I had forgotten to equip the rations). It did feel as though Blade Wolfs Zandatsu didn't reach as far as Raiden or Sam. I'm not sure if that's true or I was just crazy. Most parts of the story can be completed without ever entering combat. Like the main game of MGR, you have the option of straight up fighting all the enemies, or stalking around and stealth killing them. This is my favorite part of the DLC. I love sneaking around and stealth killing guys, and did so at every opportunity. It was something I really missed in the last DLC (Jetstream Sam), and was very happy to do it again. Playing it this way made the whole thing much easier and less frustrating, so I was able to have lots of fun. I learned my lesson with the last DLC and set this one to easy, but I didn't need to. Being able to sneak around and kill enemies instantly negates much of the difficulty in fighting them. On a second go around, I set it to normal and so far haven't had any trouble spots. The Blade Wolf scenario is pretty short, as my final time clocked in at just over 1 hour and 15 minutes. This doesn't count cut scenes or retries. Except for the VR missions, I only had to retry once. Given that I prefer to use stealth and my final finishing time, I am strongly considering trying to beat it on Revengeance difficulty in under an hour. I feel it's possible for me to do it, which is not something I say very often. I don't like playing on the hardest difficulty or speed runs, but I want to do it for Blade Wolf, which is surprising. I could easily knock down my time since I won't need to search for things. The only real difficult part would be the final boss fight. Just like Jetstream Sam, the VR Missions can only be done when they are found in the story mode. I prefer the main story where they are just unlocked and can be done later. When you access one, it will reset the checkpoint, so any enemies you killed will be back. At least in this DLC, I could do some of these VR Missions. All the ones I ran across in Jetstream Sam were combat related. Thankfully, the Blade Wolf ones have stealth and platforming ones. These are much better for me, personally. The first sneaking one I ran across was infested with targets to avoid, but was still doable. 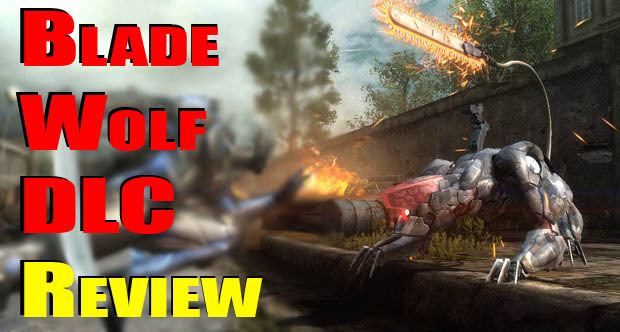 The combat ones seemed harder, mostly because Blade Wolf takes a lot of damage from attacks. While it was pretty short, Blade Wolf was really fun. It was less frustrating than Jetstream Sam due to the ability to sneak around (or kill) most of the enemies. If you are a completionist or willing to go through multiple times, it will probably be worth the money to you. If you weren't a fan of sneaking around and assassinating enemies, you might get less out of it, but it should still be fun. 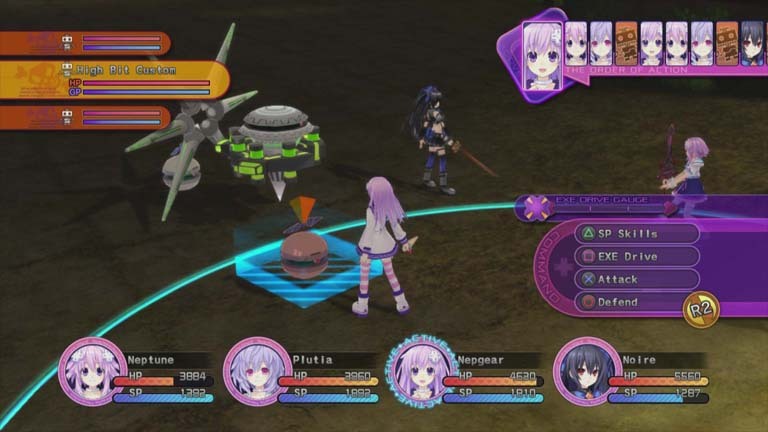 Hyperdimension Neptunia Victory has recently been released and continues the adventures of the CPUs as they try to save Gameindustri (again). For the uninitiated, the CPUs represent the first party video game systems, past and present. Many of the enemies, places and predicaments in the game are parodies of video games and the industry itself. The plots are often silly, with lots of fan service and nods to other games. There are slight improvements to the graphics this time. Of course I like the look of the characters in this game, and their in-game models are better than Neptunia Mk2. The cut scene graphics have more movement to them, but not much. The dungeons looks better than the last game, with more detail in the scenery. Some of the dungeons do get repeated, though with slight differences. There are lots of new enemies, too, and some returning ones as well. Another improvement over its predecessor is the UI and town. It's not really important, but the towns look better to me. The UI also seems easier to navigate, as I could figure out where to go to do what I wanted. Finding the challenge list (more on that later) took me the longest, and even that wasn't more than a few seconds. Setting combos and assigning party position is easy and intuitive. Speaking of combos, there are a few changes to the battle system. Yes, you still move around on a small field and position your attack, same as the last game. Enemy attacks also seem to have a huge range again. While standing still, holding L1 or R1 will slowly rotate you, making it easier to aim your attack box and hit multiple people. I don't remember this in the previous game, and it is very useful when aiming your attacks to hit multiple targets. Anyway, back to combos. You have three different attack types, Rush (for multiple hits), Power (does more damage) and Break (does more guard damage). Up to three attacks of each type can be set. After your initial attack, you have up to three more attacks you can combo into. It sounds much more complicated than it is. As you level up, you will earn new attacks, and can set up the combos however you like. Setting each attack requires a certain amount of CP, so you can't just set all the best attacks. However, you could set less of one type to have more CP for the type you prefer. I really like this setup, so you can choose which attacks you want depending on the situation. For example, use only Break attacks to break the enemy's guard, then use Power attacks when they will take more damage from them. It's fun to make your own combos, and makes combat pretty fluid. You also aren't locked into using just one type, so you can avoid using an attack if the enemy is resistant to it (ex: initial attack -> Rush -> Rush -> Power). There's also SP moves that use your SP gauge (similar to MP in other games). You might think that sounds like the last game, and it does. So to mix it up, they have now added an EXE meter that fills as you land attacks. When a section fills up and it gains a level, you can do special EX finishers at the end of your combo. Using an EX finisher will not deplete the gauge, so you just get extra damage, which is great on the bosses and fierce monsters. An EXE Drive, on the other hand, will take a protion of the EX Drive Gauge for a super powerful attack. This gauge resets when you leave a dungeon, which is why it's good that enemies will respawn while you are there. Later in the game, you get team EX Drives, which can be activated when you have certain characters paired up or in the battle together (and the appropriate Lily Rank). These take more EXE gauge levels, but are even more powerful than the single character ones. So it matters what characters are in battle and paired with each other if you want to have access to more special attacks. And if you are like me, you will want to see each special attack at least once. "Yay team attacks!" Also: "Yay, Vert!" As previously mentioned, enemies will now respawn throughout the dungeon while you are present (they didn't in the last game). In a lot of ways this is helpful, so it is easier to grind experience, certain enemies and items. Of course, this can be troublesome when you are barely making your way through the dungeon and trying to run for the exit. If you have one, an Eject Button can help, but it's actually not that hard to just avoid the enemies and make your way out. So while there is a little inconvenience at enemies respawning, it's actually really helpful. There are now challenges for each character to accomplish. It's the same list for each character, and several require you to be the party leader. They are fun to do (for me), but more importantly, they will increase your stats or unlock bonus voices. The stat gains are small at first, but as you unlock each subsequent level of the challenge, the gains increase (and they are cumulative). You get a lot of them by just playing the game (hit or miss with attacks, kill monsters, take damage, receive healing, etc. ), so those don't require any effort other than having the character in your active party. The challenges that require you to be the party leader will require some effort (or lack thereof), since you will jump a lot, run around, get preemptive strikes, and more. There's even one for standing around in a dungeon. It took me a bit to train myself not to pause so I could work towards this whenever I needed to go to the bathroom/ deal with a child/ eat food/ etc. The challenges can take awhile for the highest level (especially standing around for so long with every character) if you want them all. The added stats help, but they aren't necessary if you don't want to get them. A new Scout system has been added too. You can send out little avatars (people that reside in the towns) to check out the various dungeons. They can find items, money, change what monsters appear, change experience/item drop/money drop rates, or find hidden places. It costs money to send them out, but it is very worth it. You need them to change the monsters to complete some of the quests, so use them as much as you can. At the end of each chapter, Scout usage is also one of the things they grade you on, so keep sending them out. Most dungeons now contain flags that you can break or stand. This affects what the scouts can find or change about it. It's worth using them as much as possible to get the most out of the game. The story is silly, and frequently breaks the fourth wall, but I enjoyed it. After getting yelled at for being lazy, Neptune goes out on a quest and ends up being sucking into the past of an alternate dimension. Basically, she was transported to a time when Lowee was the only real console, and Lastation was just about to form. 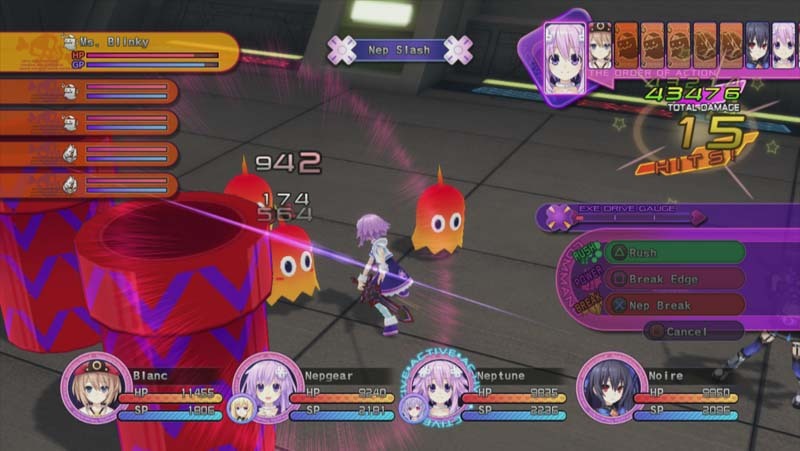 She meets a new Planeptune CPU named Plutia, and together with the other CPUs, must defeat the growing threat of the Seven Sages. Don't go in expecting a serious piece about the troubles of mankind or the existential reasons for suffering. If you enjoy parodies, just relax and enjoy all the oddball scenarios and jokes about video games. A good chunk of the lines are voiced, but not as many as I would think (I played in English). The voice acting is pretty good, though. My favorite parts are mini-Histoire's emoticons when she's talking. It's a little thing, but it really sets her apart from her other version and the other characters. The music is also decent, with the Seven Sage's theme being my favorite since it sounds a little goofy. While the story is fun, there can be lulls between segments. Most times, advancing the story is gated behind the various quests obtained from the guild. The game does tell you that some quests must be completed to advance the main story, and you will have to do the non-repeatable ones to move the plot forward. This makes the main story seem aimless at times, since you have to do what could be considered side quests just to advance. Most times you have to kill a powerful monster, so it might just be a way of making sure your level is high enough to complete the next portion of the story. This can be good, since the bosses get pretty tough. They take a lot of damage to kill and they can dish it out in spades. It was kind of annoying to stop doing the story and figure out which quest to do so I can get the next event, or grind a bit to beat a boss. Counting all of this, though, the main story can easily last over 35 hours. It took me over 45, although there was a bit of that just spent sitting in dungeons (for the challenges of standing still, since it's better than pausing). There's also three endings, but new game+ makes subsequent runs easier and shorter. I'd say there is good bang for you buck here, as any RPG should have. If you are after the trophies, the list is secret again (yuck), but they aren't very hard. You get one for all the endings, so you will want to go through multiple times if you want that. The longest trophy is maxing out each of the girls' Lily Ranks with each other, but there are some discs that make that faster. 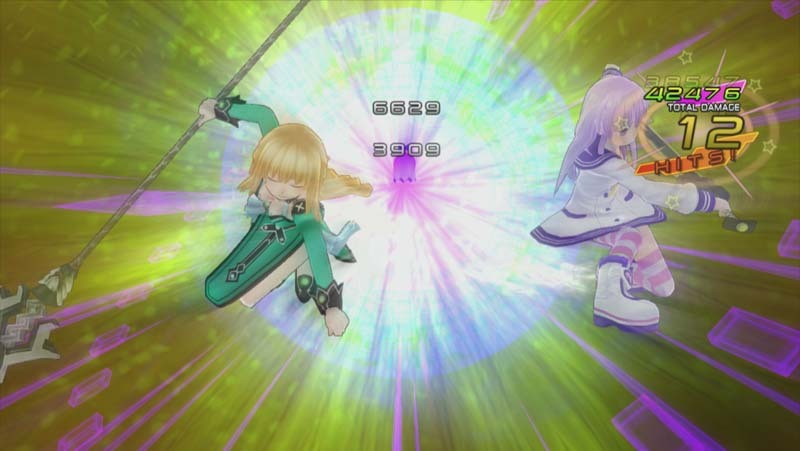 Overall, I enjoyed Hyperdimesion Neptunia Victory. As was the case in Neptunia Mk2, you probably don't want kids around for some of the scenes and dialog. There is tons of fan service here, and a silly story. The special moves are flashy and fun to watch. It can be a bit aimless at times, and involve a bit too much grinding, but I ultimately enjoyed playing the game. The demo for Fuse from Insomniac and EA hit PSN and Xbox recently, so I figured I would check it out. It's a four person co-op third person shooter (try saying that three times fast). There are four playable characters to try, experience to earn and many guys to kill. There are four characters to choose from, each with different abilities. Dalton's gun has a shield that absorbs bullets, and it can launch them at a nearby target. This ability is really nice, since you will be shot at a lot. The vulnerability after using it might be dangerous on higher difficulties, though. Dalton's alt fire sets a stationary shield for a time. Jacob has what essentially looks like a bowcaster. It fires powerful single shots, and the alt fire will light someone on fire that has recently been hit. Naya has a rapid fire rifle that will create a wormhole in any target she kills, which will damage nearby enemies. Killing an enemy with the explosion will create another, so you can easily chain kill weak targets. Her alt fire has her turn invisible. Yeah, I like that a lot. The last character, Isabelle (Izzy), has a rapid fire weapon that will encase a target in crystal, making them easy to shatter. Her alt fire is a med beacon. I tried all four characters, and I liked Naya and Izzy the best. I'm sure if I used Dalton, I'll get killed while trying to be Superman with his ability. Jacob makes a good sniper, so I know which of my friends will pick him. I really like Naya's invinsibility, and can definitely see myself using that often. Izzy had my favorite weapon (the rapid fire crystallization gun), and the med beacon will be really useful when playing with my friends, since the group I will likely run with loves to play on the hardest difficulty. Getting a level up gives points to buy character skills, allowing you to fine tune your character. It's not as advanced as Borderlands, but I'm all for some RPG elements in my games. Characters also can equip a team perk that everyone will benefit from. I didn't get to try these in the demo, but there were some good choices in there. Most of the controls are pretty standard. You can fire your weapon, aim down the sights, throw grenades, take cover, roll and sprint. I kept accidentally hitting the roll button when trying to take cover, since I'm still playing Gears of War 3 with my friends every week (my fault, I know). This will have you vault over the cover, which can be useful (just not when you accidentally do it, haha). There's also a melee attack, but I didn't have any use for it in the demo. I really like that the select (or back) button will pull up the squad members, so you can switch who you are controlling on the fly. I imagine this won't work in four player co-op though. You also get a stealth kill, which I will want to use a lot, since I always enjoy a good assassination. The environment you start in is pretty cool, you have to climb up some pipes and cliffs in on a snowy mountainside. You quickly make your way to a base nearby, and have to kill lots of guards before making your way further inside. It was pretty fun to fight the soldiers, but it felt like there were too many in any given area. They seemed to come out of nowhere, so in a small courtyard, I fought at least twenty soldiers. If every encounter is like this, I imagine they would run out of soldiers in an hour. There is online and split screen co-op, but I didn't get a chance to try those out yet. The game was pretty fun solo, and I'm hoping to try the full version. I'm betting the co-op is even more fun, so I want to try that with some friends. Poker Night at the Inventory 2 follows in the footsteps of its predecessor and has you, the player, playing poker with four different characters from different universes. Each character is pretty faithfully represented. Claptrap looks and sounds like Claptrap. Brock Sampson has gone from 2D to 3D, but still sounds the same. Glados is...well, Glados, and will berate you at every turn, as she should. Ash is not voiced by Bruce Campbell, which did take a little getting used to. As the name gives away, this is a poker game. You have two different types- Texas Hold Em and Omaha. When you start the game, there are a few tutorial messages explaining how to play Texas Hold Em. I already knew how to play it, but I read them anyway. After losing my first tournament, I decided to try Omaha. There were no automatic tutorial messages for how to play that, though. I later looked up how to play Omaha from the help menu, and realized why I kept losing hands. I went back to Texas Hold Em, and have had much more success after getting in the swing of it. I like that there are two different poker games, though. If you are better at one, you can play that, or mix it up by switching between the two. It's a nice bit of variety. 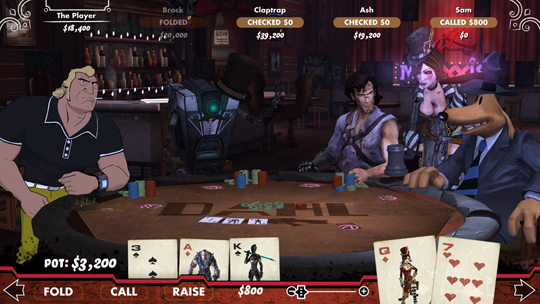 Since the basis of the game is that you are the fifth person playing poker with the other four characters, there is no multiplayer option. While others might see this as a negative, I see it as a positive. If you just want to play poker against real people, there are plenty of options. Online multiplayer has a lot of downsides, so I really like that it's a single player experience. Local multiplayer would be pointless too, since you would need multiple screens to make it effective. The draw here is playing poker against characters and listening to their banter, which I find really entertaining. Winning a tournament (or placing in the top 3) will give you some tokens. These tokens can be used to buy different skins for the chips, deck and the table (felt). There are skins for each of the franchises represented (Borderlands, Sam and Max, Venture Bros., Army of Darkness, and Portal), and equipping the chips, deck and table from the same franchise will change the whole environment to reflect that series. As a fan of Borderlands, I really like that one, but the Sam and Max one is cool for the film noire-looking ambiance. It's not too hard to at least come in third place, so you can at least get a few chips and begin working toward getting them all. It will take some work and dedication to get them, but worth it. Buy someone a drink to make them easier prey. There are also several extraneous goodies to unlock while playing the game. My personal favorites are the different skins and heads for use in Borderlands 2. You are given three target challenges, and when they are completed, the next tournament will have a character place a personal item up for the winner. If you win, you will get the item, which will unlock the heads/skins for Borderlands 2, and avatar awards for your Xbox Live avatar (the PS3 version gets dynamic themes). If you are interested in the achievements, they aren't too hard or long to get. Winning each personal item is worth an achievement, as is equipping all of a set for each game represented (chips, deck and felt). Being good at poker will make these go faster. I'm not that good at it, but I can keep plugging away at getting all the unlockables (since I do like unlocking stuff) and winning the personal items to get the Borderlands 2 items. Personally, the hardest one to get is having a winning total of $1 million. To get that, you have to win 10 more tournaments than you lose. So you can see why being good at poker would make that go much faster. Sadly, there were a few bugs in Poker Night 2. I had the game lock up on me twice, requiring me to turn off my system. The game saves after each hand, so I didn't lose much progress. The other was a lot more inconvenient. The "press A to start next hand" appeared on the screen, and would not go away. I could not actually start the next hand, and hence, could not progress in the tournament. I backed out to the dashboard, but that didn't help. The only thing I could get to work was starting a new tournament. This counts as a loss, so I was out $20k, making the $1 million achievement even that farther away. Plus, if you get this while winning a tournament, it will be even more disheartening. I was pleasantly surprised and had fun playing Poker Night at the Inventory 2. I'm not a big poker player, so I don't have the confidence to play against other people. The single player nature of Poker Night 2 makes it a good poker game for me. I also really liked the different things you can unlock. I enjoy listening to the characters talk to and make fun of each other. It feels like all they all just got together to enjoy a night of playing poker and talking, which is exactly what it is supposed to feel like. 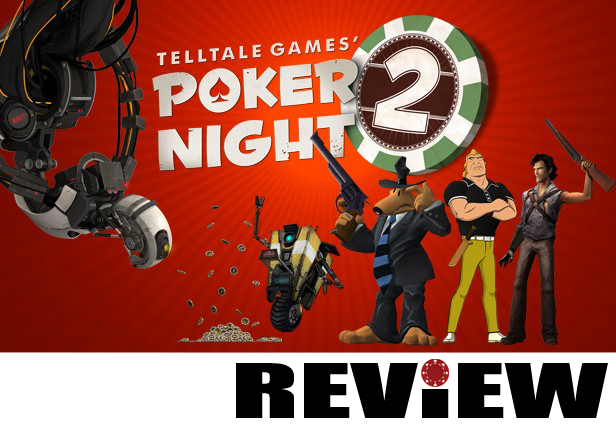 If you are a fan of at least one of the games (or show) represented, or want some cool unlocks for your avatar or in Borderlands 2, definitely check out Poker Night 2. One of the last games being released on the PSP, Black Rock Shooter: The Game has made its way to the Playstation Store. This unique action RPG has fans play as BRS, a super powerful warrior that players will discover more about during the course of the game. So what makes this unique? The battles. When you encounter an enemy on the map, you will enter battle (no that's not the unique part). You don't select an attack or move your character like other RPGs. You can block, dodge, attack or use a skill. The block does what you would expect. I found it much more reliable than dodging, but you will still take some damage. When dodging, you basically move between two positions. Therefore, mashing the dodge button can actually put you back into the attack you were trying to avoid! In games, I prefer to dodge than block, but I tended to misjudge a lot of the dodging. Different attacks come at different speeds, so it can be trickier than you would think to dodge them. Plus, when there are several enemies attacking at once or close intervals, it can be all but impossible to come through unscathed. Blocking is more useful earlier in the game, while learning to dodge will be better for the stronger hits. To properly aim your attack, you actually move around a reticle. When it's close to an enemy, it will lock-on to them. The lock-on holds pretty well, unless the enemy moves behind another, zips around quickly, or is one of the few who uses a technique that blocks lock-on. Shooting while moving the reticle is possible, and can be really helpful on the faster foes. You shoot with the square button, and the number of shots is determined by your equipped weapon and the amount of heat you have. The higher the heat gauge, the less shots per attack. Basically, each attack will give you 10% heat, as will each dodge. Blocking will not increase heat, but it will not decrease while you hold it. Standing still will lower your heat, which gives the longer battles a kind of ebb and flow of action and patience. It's a fairly good system, since you don't have lots of fancy options, it's up to you to use them when they are the most beneficial. As mentioned before, you can equip and use a variety of skills from buffs, to healing, to a stun snipe and a few attacks. Some challenges will even upgrade them to a more powerful version. There's also lots of RPG elements mixed in with the action. Winning battles gives you experience, and your level determines your maximum HP. You also get several healing items to use in battle, but you can only hold a max of 5 of each type. This limit is a bit low for my tastes, but enemies tend to drop lots of healing items, so you can use them regularly and still be fine. There are also challenges for each stage that award you with a stat boost or skill when completed. Most of them come from just killing all the enemies you run across, but there are a few you have to try for, like completing a certain timed mission in 5 minutes or taking no damage on a certain section. This is your battle perspective. Most fights in Black Rock Shooter are not too hard. A few of the bosses can be difficult, especially in the later half of the game. Most bosses have two health bars, and change tactics and attacks from one to the next. As long as you practice and learn when to dodge and attack them, they can be taken down without much trouble. If that's taking too long, you can always chug a few healing items to fudge the last bit. For me, the most frustrating parts were the boss of stage four and the motorcycle riding parts of stage two (tip: there are parts where you can drive on the walls) While the main game isn't too stressful, the extra missions unlocked after you beat the game can get downright brutal. Completing the game takes some skill, pattern recognition and determination. Getting 100% in the game takes even more. The story is told through several cut scenes that all have the original Japanese voice track. Usually I prefer dubbing, but since the action pauses when there is dialogue, you are not trying to read while dodging enemy fire. The plot is fine, not the best but not terrible. The main plot focuses on BRS trying to defeat the aliens that have all but hunted the human race to extinction. There's a twist or two, but the fate of the 12 surviving people of the human race (all men for some reason) is fairly predictable. Well, at least for the normal ending. After the first playthrough, the dialogue options presented at certain points can affect the outcome of the story, giving a reason to go through it again. The first run of the game can last between 9 and 12 hours, depending on how much you need to grind or redo the harder fights. That's basically just doing the story missions. There are six stages, and the first five have five story missions each. After you defeat the boss of a stage, you unlock the "hunt" version of it. The hunt level is just the entire stage with no breaks or save points, and there are special enemies to find and kill that unlock pictures and music tracks in the gallery. You also have to fight the boss again at the end to unlock the movies of the stage. I would usually do these after beating the boss so I could get a little extra experience (they state you get less during the hunt missions) and because I like to unlock stuff. I have not seen the anime that Black Rock Shooter: The Game is based on, but I was still able to follow the story. It's a pretty fun game, and the battles are something new and sometimes frantic. It is certainly a PSP game, and you can tell by the graphics. They aren't bad, but they aren't great (it is an almost two year old game after all). If you are looking for a unique RPG to play on your PSP (or Vita), go ahead and try Black Rock Shooter: The Game.